Let’s be honest, I really make this recipe because I am totally obsessed with cornbread. Forget Thanksgiving, I want cornbread all year round. On top of chili, doused in gravy, transformed into biscuits and muffins and cakes … oh my! I think the reason it’s such a great compliment to so many dishes is because it brings a slight sweetness to a savory dish, and if you REALLY know how to whip up a good cornbread, it can be oh so moist as well. For this recipe, I usually go with a store-bought cornbread. I know. I KNOW. My local supermarket’s bakery makes a seriously amazing cornbread. I think for a recipe that’s as simple as this one, it’s totally OK to go store-bought. 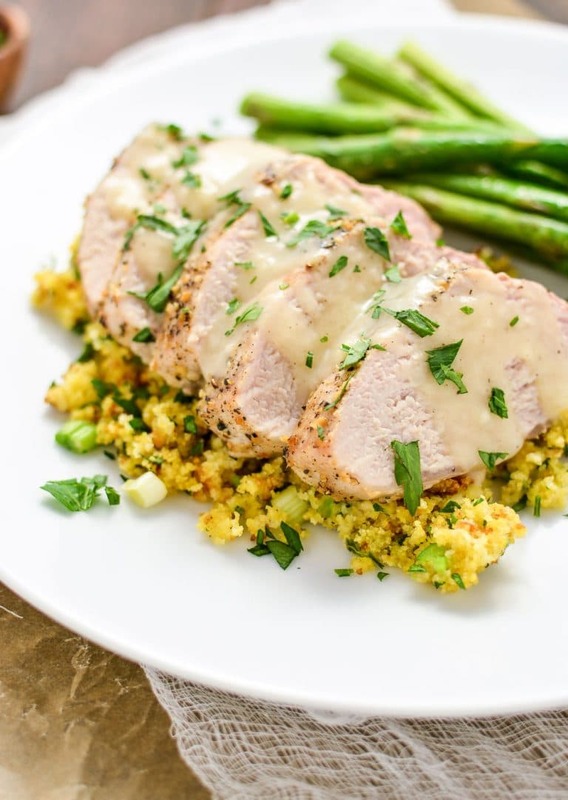 Recipe for this roasted lemon pepper pork tenderloin with cornbread stuffing is below! Check it out! 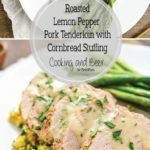 Tender pork tenderloin with cornbread stuffing and savory lemon pepper seasoning. 2 tablespoons lemon pepper seasoning Trader Joe's sells a great one! Serve with fresh veggies such as green beans or asparagus. Preheat your oven to 375 degrees F. Line a large baking sheet with foil and spray it with a nonstick spray. Season the pork tenderloin generously with the lemon pepper seasoning, rubbing it all over. 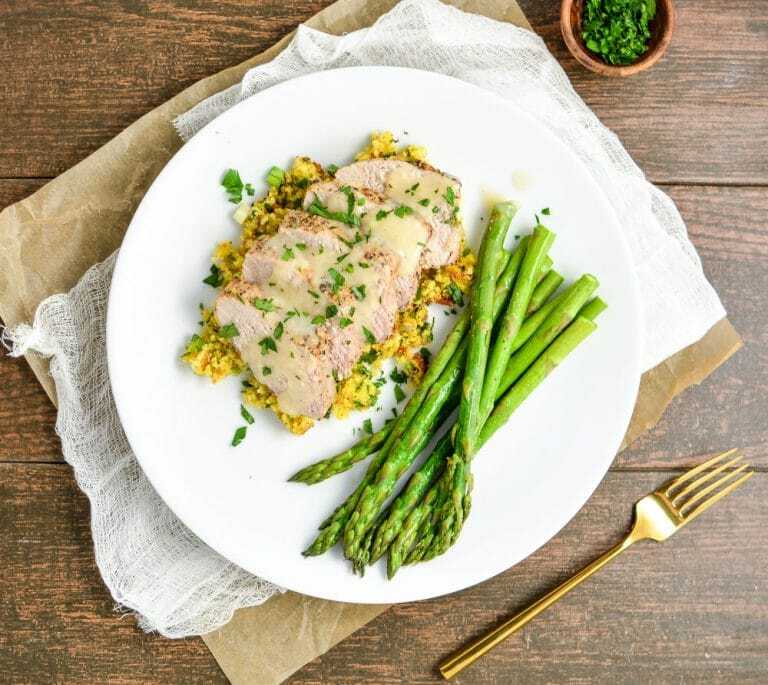 Place the pork tenderloin on the prepared baking sheet and spray the pork with a nonstick spray. Place it in the oven and roast for about 45 minutes to 1 hour or until done to your liking. Use an instant read thermometer for desired level of doneness. I cooked mine to 145 degrees F for medium rare (see note). While the pork is roasting, prepare your crumbled cornbread. To a large bowl, add the cornbread, egg, jalapeno, parsley, green onions, salt and black pepper to taste, and milk. Stir to combine and pour it into an oven-safe baking dish that has been sprayed with a nonstick spray. Place it in the oven with pork and bake for 20 minutes or until slightly brown on top. Remove from oven and cover with foil to keep warm while you prepare the rest of your meal. When the pork has finished roasting, remove it from the oven and pour the juices (if there are any) into a large nonstick skillet set over medium heat. Cover the pork tenderloin with a foil tent and allow it to rest for 10 minutes. Add the butter to the pan with the juices. If the pork has not released any juices, add an extra tablespoon or two of butter. Melt the butter and then whisk in the flour. Let cook for a minute or until golden brown, then whisk in the chicken broth and continue whisking until the sauce is a thick gravy. Season generously with salt and black pepper to taste. Remove from heat. Slice the pork and set it over a bed of cornbread stuffing. Serve with your favorite veggies and enjoy! I used store-bought cornbread for this recipe. If your local supermarket doesn't have it, you can easily find cornbread mix in the baking aisle. 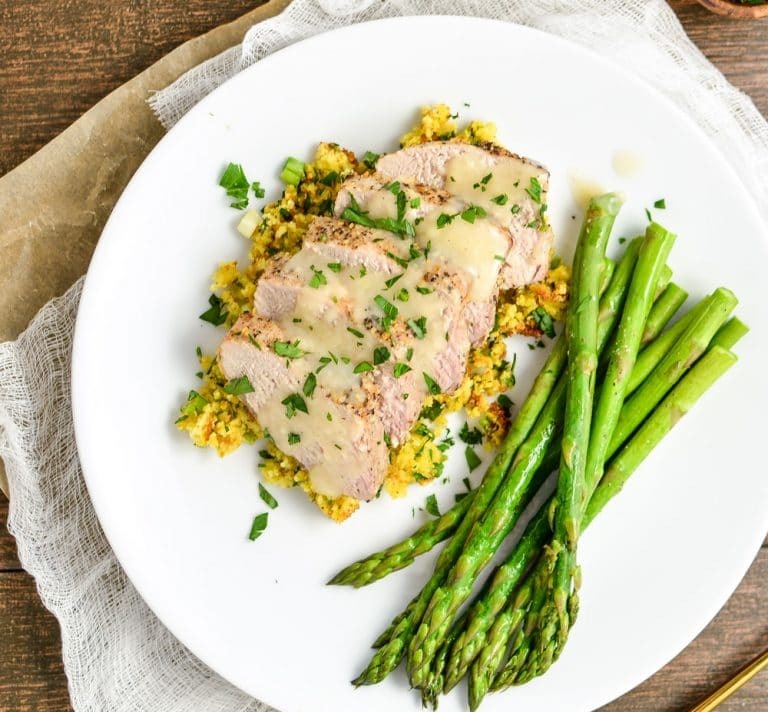 Although the USDA has said that it is safe to consume pork tenderloin at 145 degrees F, many people are still wary. Cook this pork to your desired level of doneness.